Yehuda Avner, a favorite writer of mine, has an article in Jerusalem Post, "Israel does not need Palestinian recognition," in which he argues that Menachem Begin, were he alive today, "would be saddened, indeed outraged, at Prime Minister Ehud Olmert's insistence - in consort with the US and the EU - that Hamas's political legitimacy be conditioned, inter alia, on its recognition of Israel's right to exist." "Right to exist?" I can hear the late prime minister roundly chastising his younger successor who declares himself to be a Begin disciple. "Are you telling me, Ehud, that our right to exist in Eretz Yisrael has to be sanctioned for political purposes by an intrinsically anti-Semitic, murderous Palestinian Arab terrorist organization?" Avner (who served on the personal staff of five prime ministers, including Begin's) then tells an anecdote about Begin on the first day of his premiership in 1977, dealing with the question of winning recognition by the PLO. It ends with his asserting, "I don't need Palestinian recognition for my right to exist." Two hours later, at the podium of the Knesset, Begin warmed to this theme. "Mr. Speaker: We were granted our right to exist by the God of our fathers at the glimmer of the dawn of human civilization four thousand years ago. Hence, the Jewish people have an historic, eternal and inalienable right to exist in this land, Eretz Yisrael, the land of our forefathers. We need nobody's recognition in asserting this inalienable right. And for this inalienable right, which has been sanctified in Jewish blood from generation to generation, we have paid a price unexampled in the annals of nations." Then he rose up on his toes, his shoulders squared, thumped the podium, and perorated in a voice that was thunder, "Mr. Speaker: From the Knesset of Israel, I say to the world, our very existence per se is our right to exist!" I sympathize completely with this sentiment; there is surely something humiliating about Israel having to win the approbation of the Palestinians. But, nonetheless, this is precisely its war goal. No matter how many times Israeli prime ministers assert Israel's existence, that is not assured until those who would eliminate Israel are finally convinced of the futility of their efforts. That means, however bitter it may be, that Palestinians must be convinced of the permanent existence of the Jewish state. Begin compared Israel to Great Britain, France, and other countries, but there is no parallel, for no one challenges their existence. More accurate would be to compare Israel to the other imperiled states, many of which are also in the Middle East. Kuwait before 2003 was even more threatened than Israel – it had ceased to exist for seven months in 1990-91 and was very much weaker than its Iraqi enemy. Bahrain could disappear into the Iranian maw. Jordan faces a number of potentially existential threats, especially from its Palestinian population. No Syrian government has fully recognized the existence of Lebanon.Politicians in these states do indeed worry about their future as an independent, sovereign polity. 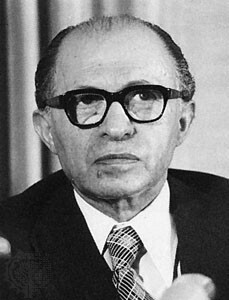 I identify totally with the Menachem Begin attitude. ... We are talking here of something much more fundamental than a claim on territory, into which category the examples you bring by and large fall. Indeed, it could be argued that most are fabrications of colonialism. We speak here of the very mystique of a people's core being, and to Jew that is not open to negotiation. Recognition of diplomatic legitimacy, perhaps, but not "the right to exist." My response: Yes, the Kuwaiti, Bahraini, Jordanian, and Lebanese identities offer a pretty thin gruel next to the richness of the Jewish identity. But the "right to exist" refers to a sovereign state, not to the Jewish identity. There remains no alternative, however unpalatable, to winning Palestinian acceptance of Israel's existence. Nobody does Israel any service by proclaiming its "right to exist." Israel's right to exist, like that of the United States, Saudi Arabia and 152 other states, is axiomatic and unreserved. Israel's legitimacy is not suspended in midair awaiting acknowledgement. ... There is certainly no other state, big or small, young or old, that would consider mere recognition of its "right to exist" a favor, or a negotiable concession. Arab reluctance to accept Israel: "Since , we have made peace with Egypt and Jordan, but the obstacle to widening the circle of peace remains what it has always been: the refusal of Israel's enemies to recognize the Jewish State in any borders. Our enemies do not want an Arab state next to Israel. They want an Arab state instead of Israel." The 1947 resolution was less important than the Zionist movement: "The UN partition vote did not establish the state of Israel. It merely recognized the historic right of the Jewish people to return to their homeland and restore their sovereign existence. But had it not been for the millennial longing of the Jewish people for the land of Israel, the continuous presence of Jews here across the centuries and the seventy years of intensive Jewish settlement in the land that preceded the UN vote, this historic right would never have been realized. And even these would not have sufficed had not the sons of a tiny nation, in the wake of the horrific Holocaust, raised the sword of the Macabees and with incomparable heroism repelled an Arab onslaught that was about to overwhelm the fledgling state." The key to Israel's existence has always been rooted in strengthening Zionism and our ability to defend ourselves - and this remains the key to our existence and the key to forging a genuine peace with all our Arab neighbors. Only when some of them recognized Israel's permanence and indestructibility did they reconcile themselves to making peace with us. That is why I was shocked to hear in the press that the prime minister, [Ehud Olmert,] said: "If there will not be two states, Israel is finished." Mr. Prime Minister: The State of Israel will never be finished! Our fate will be determined by us, and us alone! Our existence does not depend on the willingness of the Palestinians to make peace with us. Our existence is secured by our right to live in this land and our capacity to defend that right. Comments: (1) Netanyahu has it right; Israel's existence "does not depend on the willingness of the Palestinians to make peace." That said, Israel's long-term security does require a Palestinian willingness to accept the Jewish state. (2) For a discussion of this related issue, see my background weblog "Recognizing Israel as the Jewish State: Statements" as well as an article of mine that appeared today on this very topic, "Accept Israel as the Jewish State?" There is seemingly no reason for a people as ancient as the people of Israel, whose rights to the land of Israel are cemented in the Bible and in other scriptures, including the Quran, to seek recognition from the nascent Palestinian entity. It is unreasonable that we should seek the recognition of a recently invented people, who never historically existed as a people in any form, anywhere. ... Truth be told, this perspective makes our demand for Palestinian recognition ludicrous.